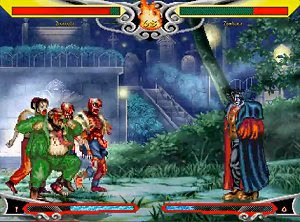 The Monster Mash is a fighting game created with the inevitable MUGEN engine, and one that shows a great deal of care in the design of the characters and backdrops. The theme is an original one, featuring classic horror creatures such as Frankenstein, Werewolf, Dracula, Zombies, Golem, Mummy and even the odd Mad Scientist. They want nothing more than trash each other in classic Street Fighter style gameplay. The game could win a lot with a few more frames of character animation, making things more smooth than they currently are. However, the scenarios are very detail and include some interesting special effects.